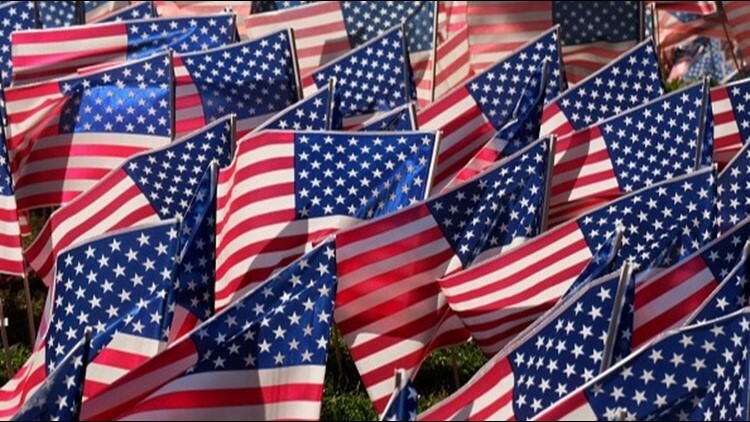 File photo of American flags. Here's everything that you need to know about the Boise Veterans Parade on Saturday, Nov. 3. BOISE — Veterans Day is Sunday, Nov 11, and there are a variety of events planned around the Treasure Valley to honor veterans that have served our country. The Boise Veterans Parade will be held Saturday, Nov. 3, at the Idaho State Capitol building. The parade festivities will begin at 10 a.m. at the Idaho State Capitol steps. The parade route will start at 10th and Jefferson Streets. It will move east along Jefferson until turning onto 4th Street and heading toward Bannock Street. The parade will continue west down Bannock Street, ending on 11th Street. The theme of the parade is a "Special Salute to WWI Veterans- the war that changed the world." The grand marshal for the event will be Earl Lewis Hurt. Hurt was born in Eagle and was deployed to France in 1917, as part of the Tank Corps. He died in Boise on June 22, 1972. Spectators are encouraged to arrive early to see the whole parade. The Boise Veterans Day Parade will also still accepting volunteers to help out with the parade. The forms to apply can be on the Boise Veterans Parade website. KTVB will have live coverage on Channel 7 and will also live-stream the parade on KTVB.COM and in the KTVB news app.